1. Ornaments. My parents were 18 when they got married, so I remember Mom telling me stories of how they had to get creative with their ornaments with their first tree since they didn’t have lots of money. Because of this, my parents started a tradition with us where my brother and I got to pick out an ornament each year. When Jack and I got married, all of the ornaments I had picked out over the years became ours (including my Big Bird ornament!). Jack’s family had a similar tradition too. I love this because we have had a tree full of ornaments since our first year of marriage. (Although I should now probably apologize to Dad because his tree became a little bare when I took 21 years worth of ornaments!). Even more so, I love this because it allows us to go down memory lane each year and remind us of what things we were interested in during different stages of life. I am so excited to keep this tradition with Hunter and our future children. This is the last ornament Mom gave me. It is so special to me, and will always be one of the most treasured ornaments on my tree. If you look in the background, you can see Hunter’s Noah’s Ark ornament we got him this year! 2. Christmas lights. Each year on Christmas Eve, my brother and I would put on our PJs, and my dad would take us to a local house that had tons of lights. I’m pretty sure Dad and I continued this tradition even when I was engaged! 3. Christmas Eve church service. This was one of Mom’s favorite traditions, so it will always hold a special place in my heart. Let’s be honest, Christmas can get busy, and it would be very easy to let it pass by without acknowledging the real reason we celebrate- Jesus’s birth. I am so thankful my family sat aside this time each year to focus on the fact that the Savior of the world was born as a baby to save us from our sin. On a non-spiritual note, one of my favorite memories from this service was when Mom’s candle lit the paper around it on fire. It was quite hilarious, and is a story we will share about Mom forever! 4. Baking. For several years, Mom would bake Christmas goodies with my brother and I. They were always simple things that we could help with. What I remember most, though, is riding around the neighborhood in our wagon and delivering the goodies to our neighbors. I hope that we can serve our neighbors alongside our children in a similar way in the future. 5. Operation Christmas Child boxes. For those of you that are unfamiliar, OCC boxes are basically shoeboxes filled with gifts for children in need. They are shipped all around the world. Each year, my brother and I packed a box for a child around our age. We have already started this tradition with Hunter! You can check out more information about Operation Christmas Child at http://www.samaritanspurse.org. 6. Christmas morning. Jack and I were both blessed to get to wake up at our houses on Christmas morning. We both have talked about how we loved having this time at home with our families and to get to enjoy the new toys Santa brought. 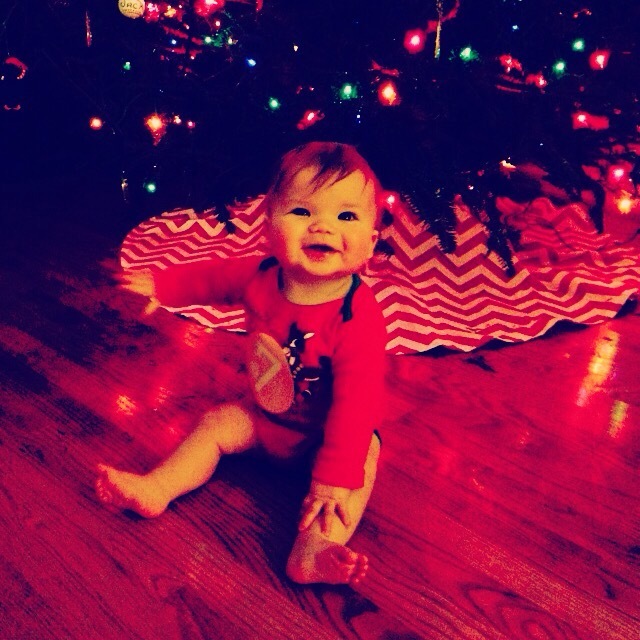 We definitely look forward to lots of fun Christmas mornings at home with Hunter and any future children we have! 7. A birthday cake/cookies for Jesus. This one is new, so we haven’t even done this yet. It came to me one night after Jack and I were discussing how we want to do fun things like Santa with our children, but that we still want our children to be the most excited about Jesus. What better way to get children excited about Jesus’s birthday than baking some sort of treat to honor Him?! We thought this might be a fun Christmas Eve tradition to do in lieu of cookies for Santa (I think he will still get plenty!). I’m excited to see how this new tradition plays out over the years! There’s many other traditions we both enjoyed celebrating. The most important thing that we celebrate, though, is the birth of Jesus Christ. My brother has recently written a song with a line that says, “You are King, yet you came for us.” This line has stuck with me so much this year. Jesus is the King of kings, yet He came to the earth to dwell among men and ultimately die for our sins so that we may have eternal life. Don’t forget to celebrate that Truth this season!